This posh mountain condo has a European flare. It is beautifully appointed and has an elegant feel to it. Granite slab counter tops throughout, stone shower and bath surrounds, Jacuzzi whirlpool tub in the one bath while shower massage in two person shower of other bath. The home is located on ground level so it has easy access. This means no schlepping suitcases, equipment, groceries, etc. up flights of stairs. Conveniently located just outside the front door is a closet to house your skis, poles, snow boards, and/or golf bags. One door over from it, is the laundry facility. In the home we have a boot/glove dryer-it's so much nicer to slip into warm, dry boots and gloves to start the ski/ride day off right. Great views from all windows will entice one to partake in the healthy lifestyle known to this high country. A walk-out patio during summer months for easy entertaining and grilling is just beyond the main living area. Parking is FREE here. As a matter of fact, once parked, your car could literally stay there your entire vacation! The shuttle service here is excellent. It will take one anywhere in the Summit they wish to go. A stop is located directly across from the complex. The condo community boasts 4 jacuzzi s and 2 saunas for residents only to relax in after a long day on the slopes. Breckenridge Ski Area lies just about a block and a half up from the home, and the Cross Country Center a block down. The quaint town of Breckenridge, often referred to as a true 'Dickens Village,' is a quick, brisk walk or a 2 minute drive down to Main Street with all its unique village shops, restaurants and/or all the modern day conveniences. 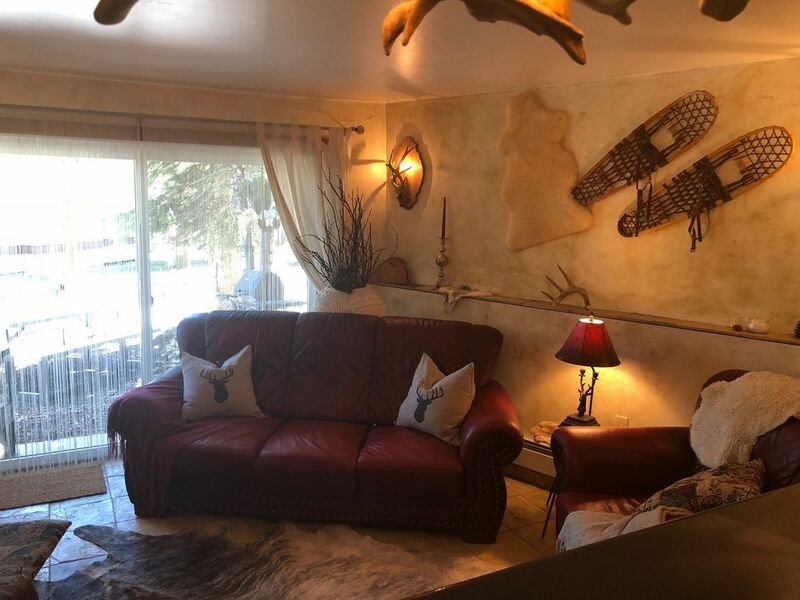 The location of this condo is perfect, in that it is quiet, yet is close enough to the village to enjoy the heart beat, or action, of the many activities the town has to offer. This is a 2 bedroom with a king in one bedroom and two twin beds in the second bedroom. The twins may be separate or pushed together. I love the location, right in between the Ski Area and the cross-country center. Close enough to walk to either, yet far enough away, so as not to have to hear the noise. Also, close enough to town for the same reasons. It is wonderful to walk out the door and be able to snow shoe by moonlight-love it. Summer time is perfect to ride mountain bikes right from the condo. The area grew up around Gold Camp. 30-40 years ago they were pretty much the only buildings up here. These were built to house those with a true desire to be on the mountain. They have withstood every blizzard, snow dump, freeze and melt, and everything in between. When the wind howls through the pines, you know you are safe and warm, ready to get first tracks down on the fresh, pure powder of the new day. Coin Laundry facilities are just outside at the next door. Each room has a T.V. Various board games and puzzles make evenings together a bit more entertaining. wooden train set with tracks, crayons and coloring books for the little ones. A remodel of the two common areas have been completed this past year. Each with 2 new Jacuzzis, saunas, showers and bathrooms. These are located approx. 250 feet from our condo. One and a half blocks down from Breckenridge Ski Area, less than a block up from Breckenridge Cross Country Center, Heated jacuzzis, saunas for guests. Free shuttle directly across from complex. Great owner, charming unit, super convenient! Our family of 4 rented this unit for a ski trip - it worked out great and right by the Free Ride bus stops. We had a vehicle, but we very easily could have forgone the vehicle rental altogether and grabbed a shuttle from DEN. This place has everything you need, and the owner is very responsive, friendly, and provided us not only all the check-in/out details, but many tips for the area. Clean, good location. Even though in condo complex it was quiet and cozy. Bed comfortable. I would go again. Small condo, perfect location but not suitable for longer stay. The condo was small and cute. It was fine for a couple of days but for four adults we would have felt crowded with any longer stay. The free shuttle is very close as is the Nordic Center which location is one of the main reasons we picked the condo. However, the downside to this condo is the layout. The bathrooms are part of the bedrooms and there are no doors on the toilets which means there was no privacy. That was an inconvenience for us. There was not adequate furniture in the living room area to allow for relaxation after a day of skiing and we assume that was because there needed to be a dinning table. For the four of us that meant one of us had to be either standing or sitting at the dinning table. Other small items are the beds are hard. So sleeping was difficult. The fans in one bathroom does not work. In one room the bed is so close to the closet that getting around the bed and not running into each other when you are getting dressed for skiing was a hassle. The shower drain backed up so when you were taking a shower you were standing in 3" of water. That is why for a weekend you can overlook a lot. For four days to a week stay these items become an inconvenience. We came to Breck for our first family ski trip and really enjoyed ourselves. The owner of this VR really knows what she is doing. Everything was a breeze: booking, directions, trip planning tips, the stay itself, and checkout - all easy. The property itself was comfortable and had everything we needed for our family of four. Location is a short drive from the two major lifts. There is also a bus stop within walking distance but we didn't use it since we have small children, driving is just easier. We'll probably do an annual ski trip and I would definitely stay here again. I'm so glad you chose to stay in my condo. Thank you for the great review! Just remember those "small children" won't be small for long...they'll be racing you to that bus stop before you know it, in order to get fresh tracks in the early morning. It will always be a terrific spot to return to to create more memories to carry you through life. I always like when the owners provide clear directions to enter the property, Heidi gives impeccable and detailed directions and everything was as she stated, we didn’t have to hunt around looking for keys or another other things necessary to get into the property. The condo itself was very comfortable and kitchen items in place to enjoy home cooking. Location is great only .5 miles to peak 8 base for those alpine skiing and across the street from the property is a fantastic cross country ski center ,first timers the instruction is great and one can also rent snow shoes for a beautiful winter hike, the propert is about a mile to town we enjoy walking and seeing the sights so that was nice but there is free bus that takes you up and down as well, if your driving parking in the complex was also easy. It is a very satisfying feeling for an owner to hear that others enjoyed themselves while at one's 'home away from home.' And we also very much appreciate it when they are willing to share this with others. I thank you for your kind review. We do always try to make things as easy as possible so that guests' time is better spent on their vacation fulfillment rather than wasting it while trying to "figure things out." Please come back and see us anytime! Cleaners came in after we arrived at 4 pm; they said they forgot to clean it. No tv cable for half the visit. To watch tv you have to sit in an eating banquette, not a couch. We both banged our shins on the bed frame, it tight in master bedroom. No shower in master, it's in the guest room. It was a convenient location. The Alpine Center is across the street and nice for walk or picnicking. Quiet condo. We should have read more comments. alpine skiing, telemark skiing, cross country skiing, rondonee skiing, skating, snow shoeing, summer alpine slide, sleigh rides, ice sailing, Recreational Center in town with climbing wall, fly fishing, angling. Lodging Taxes =12.275% One time cleaning fee of $100.00+tax IF DESIRED DATES ARE NO LONGER AVAILABLE PLEASE CHECK OUR OTHER CONDO IN THE SAME COMPLEX. LISTING number 223936. Due to the early high demand of the Christmas Holiday Season, cancellations made during this time frame for reservations will incur an additional 10% fee. CANCELLATION: Due to the nature of the vacation rental business, we cannot accept cancellations made to the Lessor less than 30 days in advance. You will forfeit all sums paid unless we are able to re-rent the property at the same rate, for the same period. We will do our best to do so, but there is no guarantee. Prior to 30 days before arrival date, we will retain 10% of the reservation.